Professor Hussain is the Dean of the Faculty of Engineering and Information Sciences, and a Professor in Systems Engineering. He has more than 25 years of teaching, research and industrial experience. His professional and academic expertise lies within the area of leadership and management in learning, teaching and research within higher education. He has a significant experience in curriculum development and quality assurance and enhancement. Professor Hussain is a Chartered Mechanical Engineer, a Chartered Mathematician, a member of the UK Institution of Mechanical Engineers and a Member of the Institution of Mathematics and its Applications. He is also a member of the UKQAA Institutional Reviewers Committee. 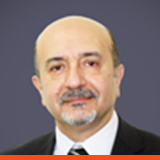 Prior to joining UOWD, Professor Hussain was the Head of the School of Engineering at the University of Bradford in UK. Professor Hussain’s teaching and research expertise lies in the areas of Dynamics and Control of Structural Systems, Environmental Water Flow and Management, and Applied Mathematical Modelling. He has published over 50 articles in reputable journals, and refereed conferences. He has supervised the completion of 13 PhDs, 6 MPhils and over 60 MSc Students. He was successful in generating industrial funding from Ford Motor Company, Hyundai Motor Company, Honda Motor Company, Hilti GB, Cummins Turbochargers, Thames Waters, and Yorkshire Innovation Funds.